Here’s how to share only part of a longer YouTube video. This trick is perfect for when you want others to start viewing at a certain point. First, go to the YouTube video you wish to share and pause it at the desired start time. It’s best to do this on the actual YouTube site. Next, click Share on the bottom left of the video information. Then, check the “Start at” box in the bottom left corner of the video player. YouTube will update the link (the highlighted one above the “Start at” check box). Copy and paste that link anywhere (e-mail, social media, etc.) and when someone clicks the link, their video will start at that point. You might want to try this with the Jump to Lightspeed videos from our Star Wars Celebration. This entry was posted in DIY FYI, Studio 300 and tagged how-to, movies, patron project, Studio 300, video, YouTube. Bookmark the permalink. When embedding a video, you can turn off the annoying feature that shows “related” videos after your video is done playing. 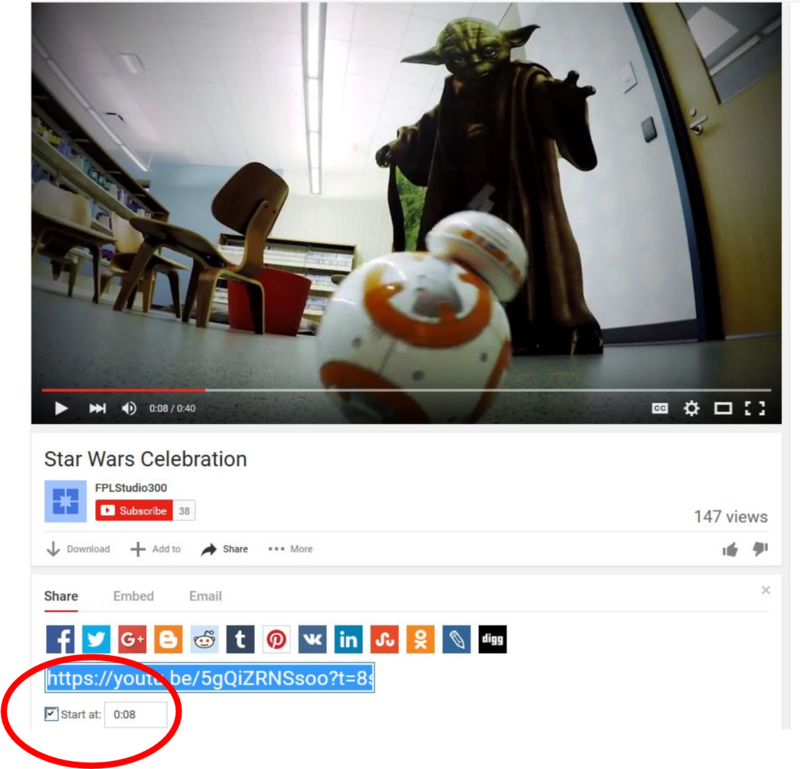 After you get the YouTube link to the video, simply append ?rel=0 to the end of the link. Presto! After the video is done playing, you won’t see any “related” videos. However, if you already shared the link to Facebook or other social media site using the YouTube controls, you won’t be able to edit the link at the social media site so that the related videos don’t show. My suggestion is to copy and paste the link to where ever you want to share it to and then append the ?rel=0 tail to the link. – Tony, aka. co-host of Fountaindale’s Practical Tech with Tony podcast.